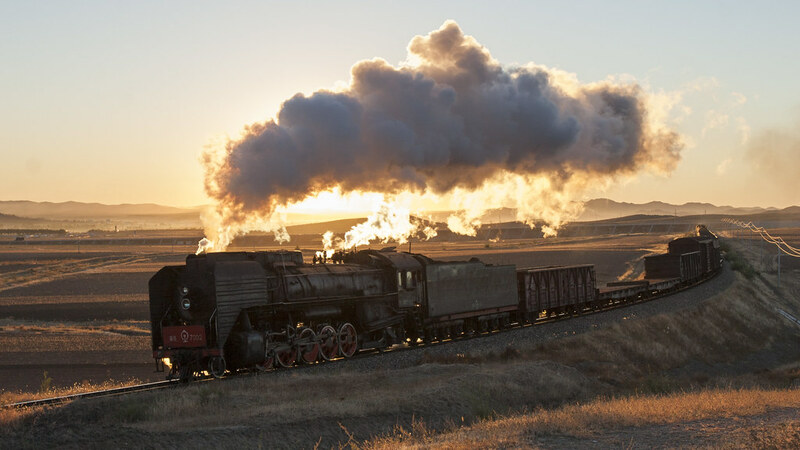 Just after sunrise on October 2, 2005, QJ 2-10-2 steam locomotive no. 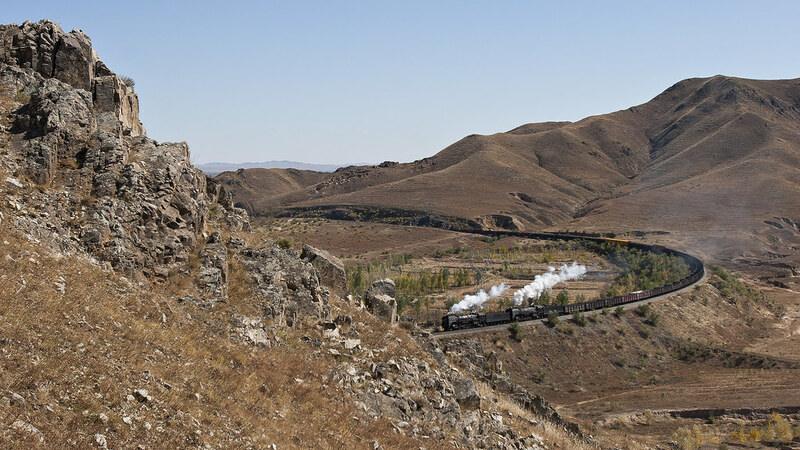 7002 leads a westbound freight train up the grade out of Chabuga, Inner Mongolia, China, on the Jitong Railway. 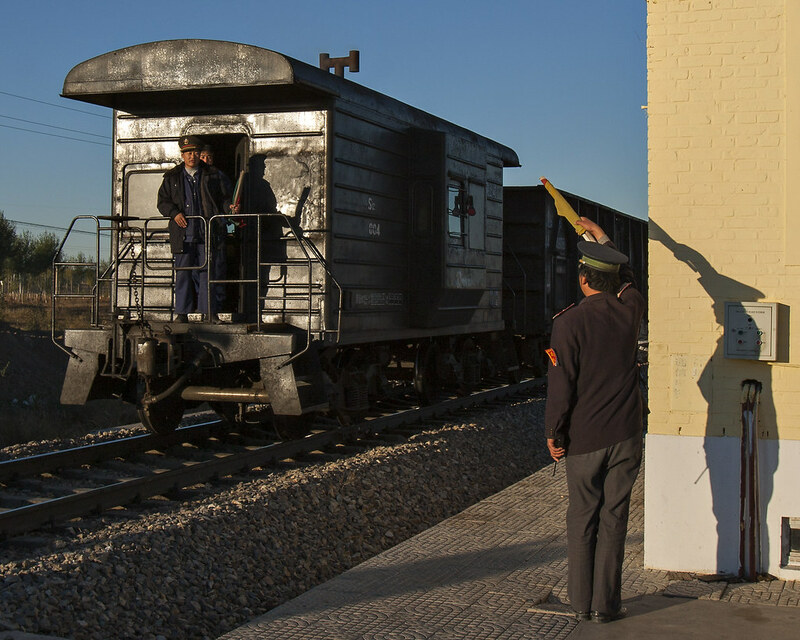 This was the first train I saw on the Jitong Line--the first of fifteen I'd see during 12 hours at trackside that day, and they were all steam-powered. 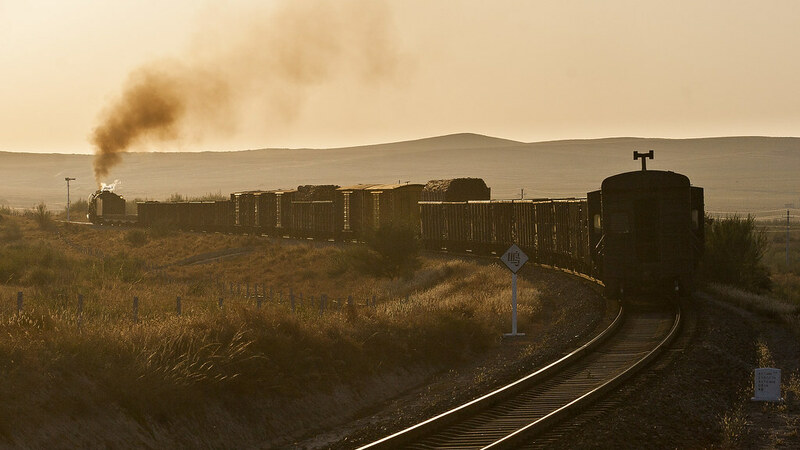 Jitong Railway workers exchange flag waves as a westbound freight train passes a road crossing near Xigou, Inner Mongolia, on October 2, 2005. 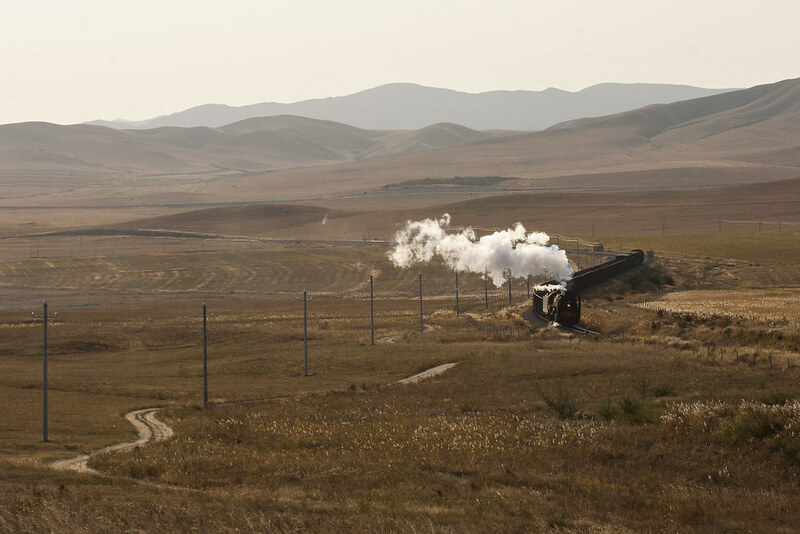 Westbound Jitong Railway freight train near Xigou, Inner Mongolia, China, on October 2, 2005. 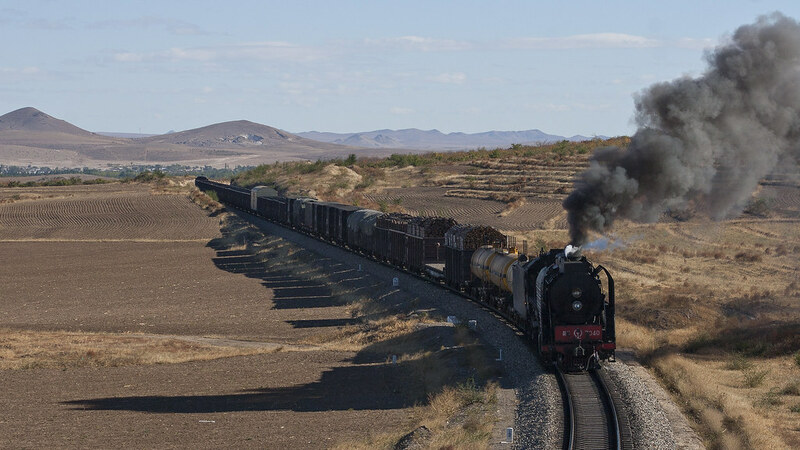 Westbound Jitong Railway freight train led by two QJ steam locomotives approaching LIndong, Inner Mongolia, China, though a sweeping curve on October 2, 2005. 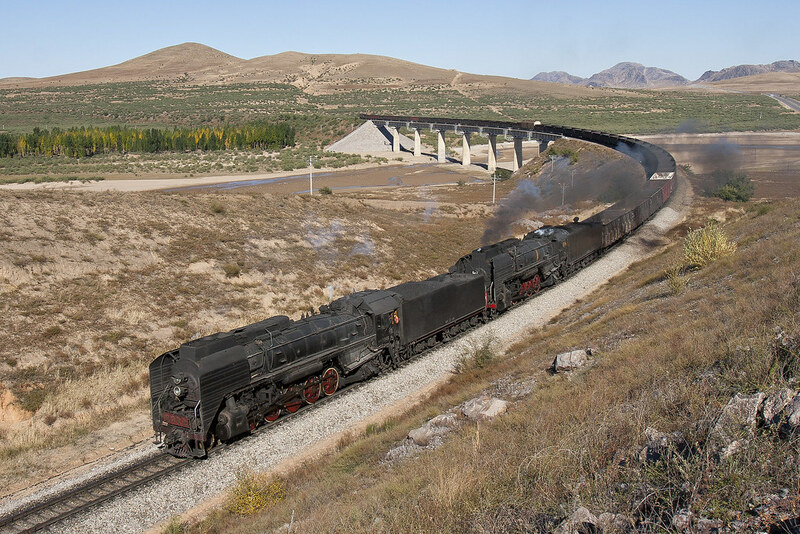 Two QJ steam locomotives lead a westbound JItong Railway freight train over the big bridge near Chagganhada on October 2, 2005. 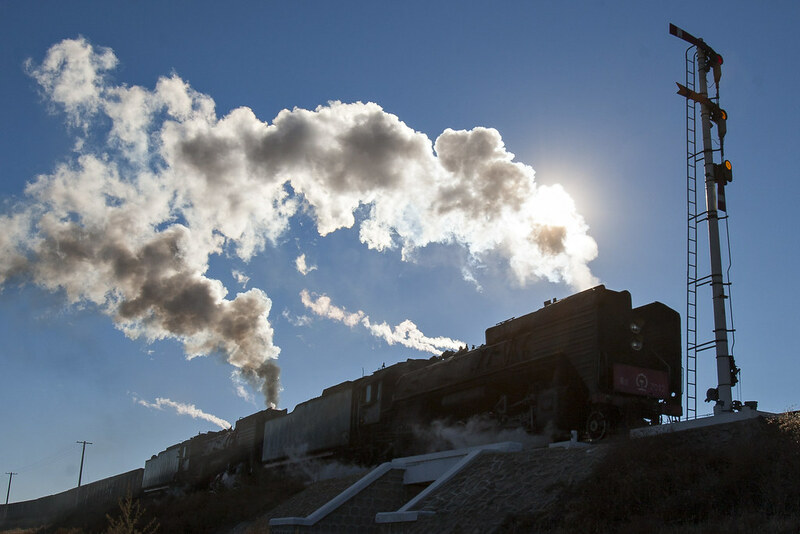 Two QJ steam locomotives pass a semaphore signal near Chagganhada, Inner Mongolia, China, on October 2, 2005. 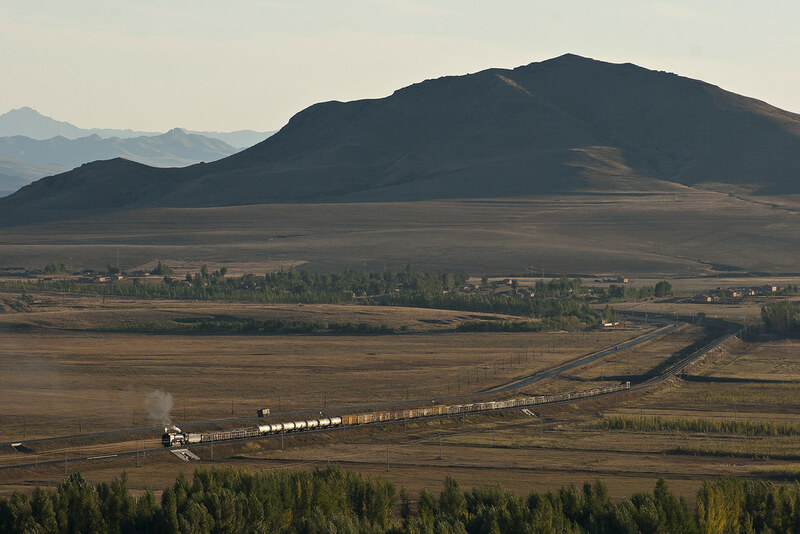 Eastbound Jitong Railway freight train rolling through the mountains around Gulumanhan, Inner Mongolia, China, on the afternoon of October 2, 2005. 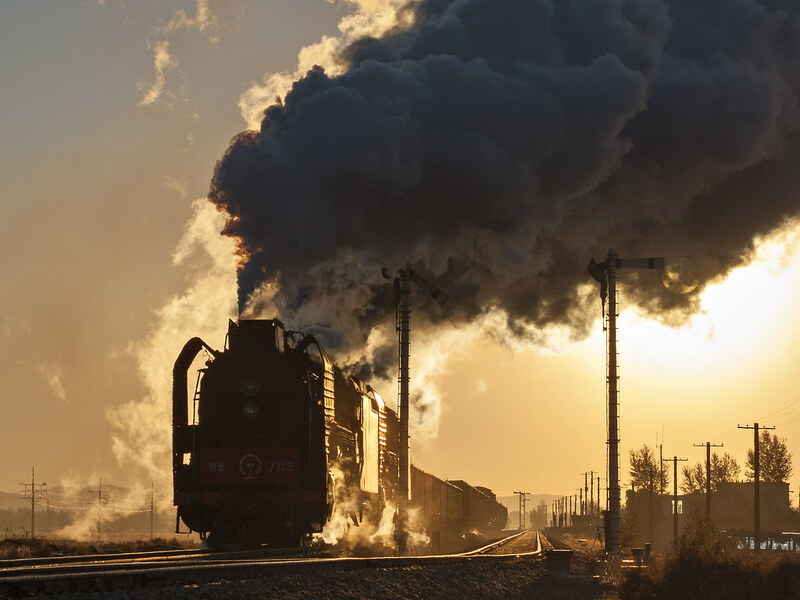 Westbound Jitong Railway freight train charging out of Yamenmiao station after meeting an eastbound at sunrise on October 3, 2005. 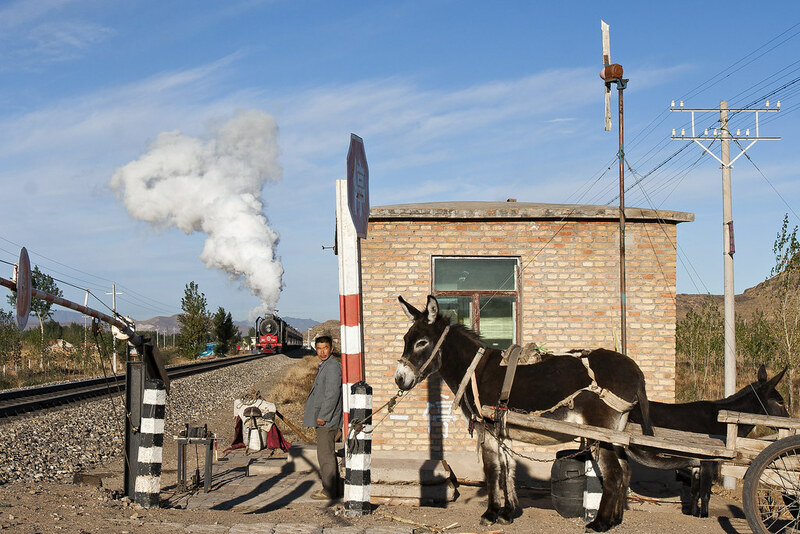 The gatekeeper's donkey waits at the road crossing in Yamenmiao, Inner Mongolia, China, as the Jitong Railway's morning passenger train approaches on October 3, 2005. 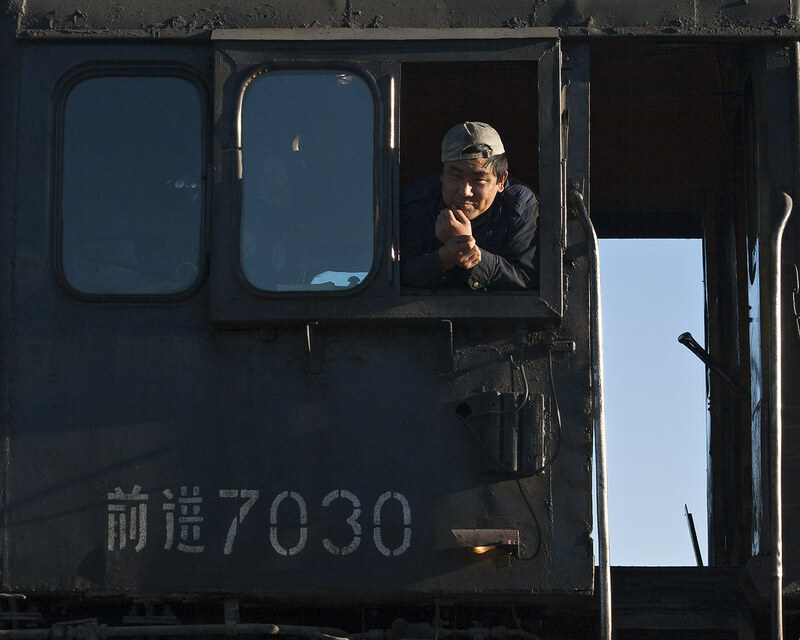 Jitong Railway worker waits as he fills the tender of a QJ steam locomotive at Daban on October 3, 2005. 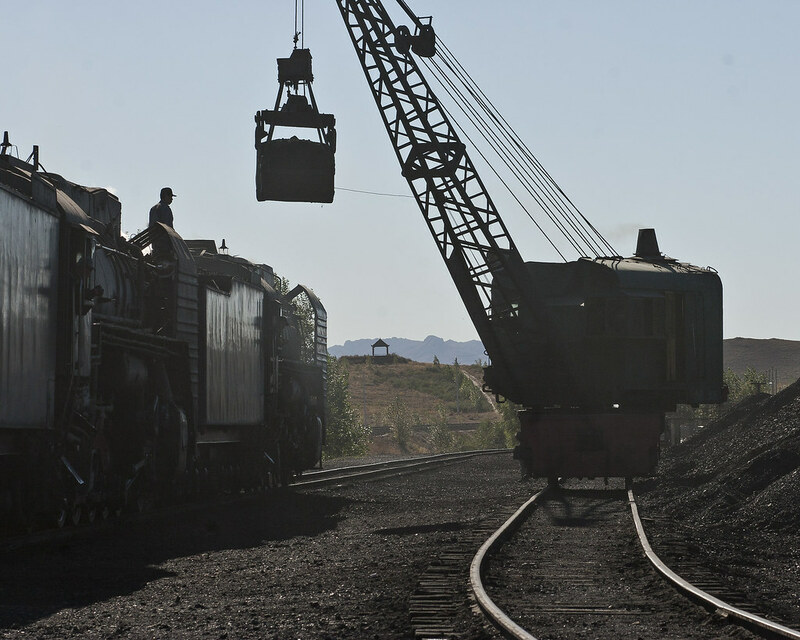 Crane used to coal steam locomotives at Daban. Jitong Railway worker in the cab of QJ no. 70730 at Daban. 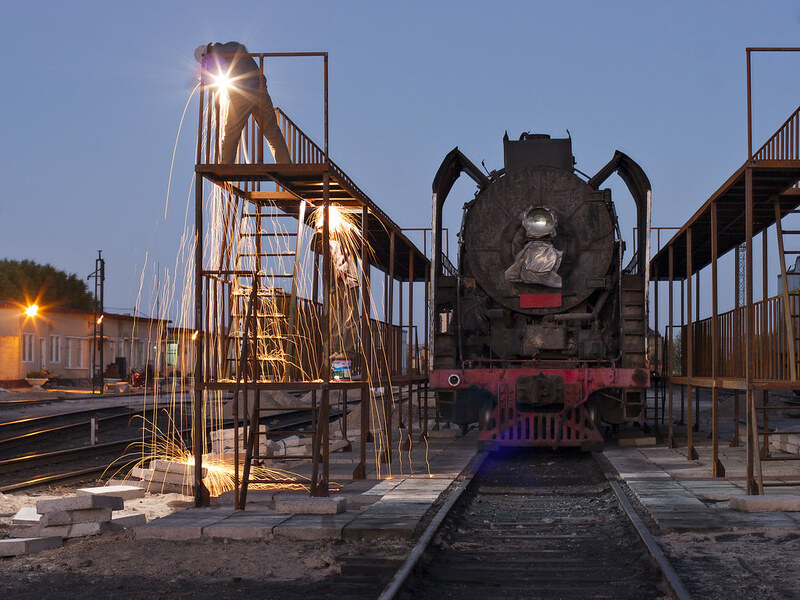 Two Jitong railwaymen work on the running gear of a QJ steam locomotive at Daban. 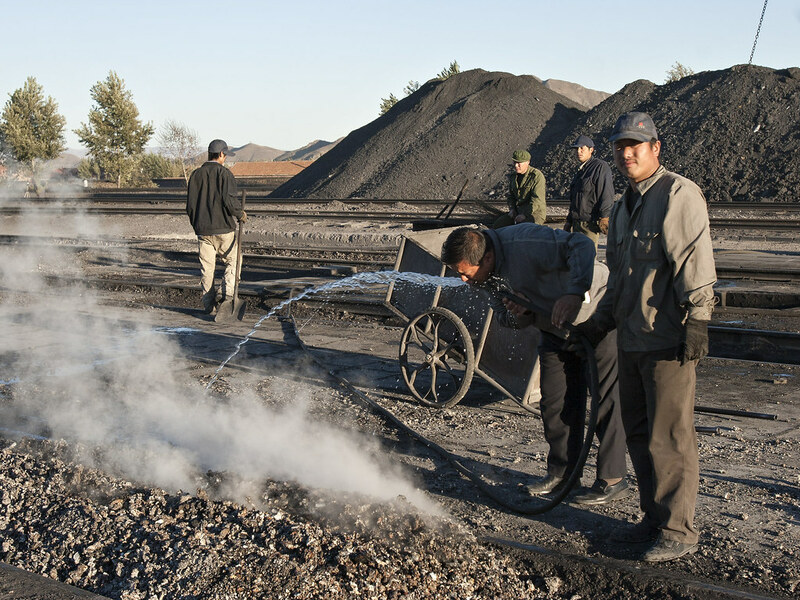 Jitong Railway worker takes a quick drink from the hose used to clean locomotive fireboxes at Daban. 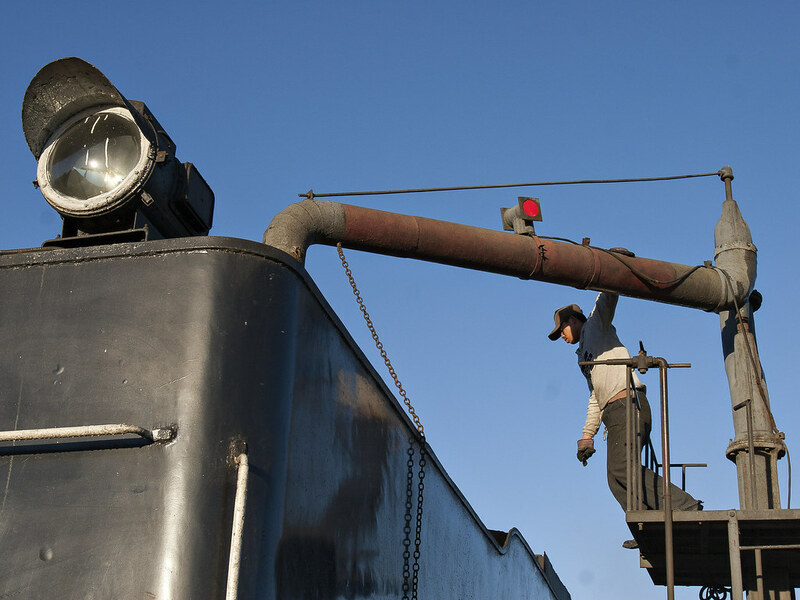 Jitong Railway worker swings the water column over the tender of a QJ steam locomotive in Daban. 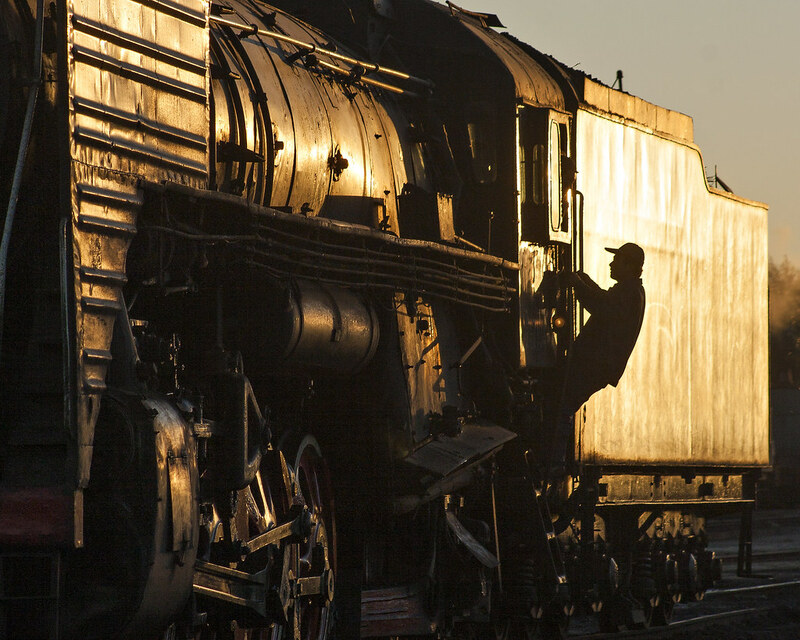 Jitong Railway worker climbing into the cab of a QJ steam locomotive at sunset in Daban. 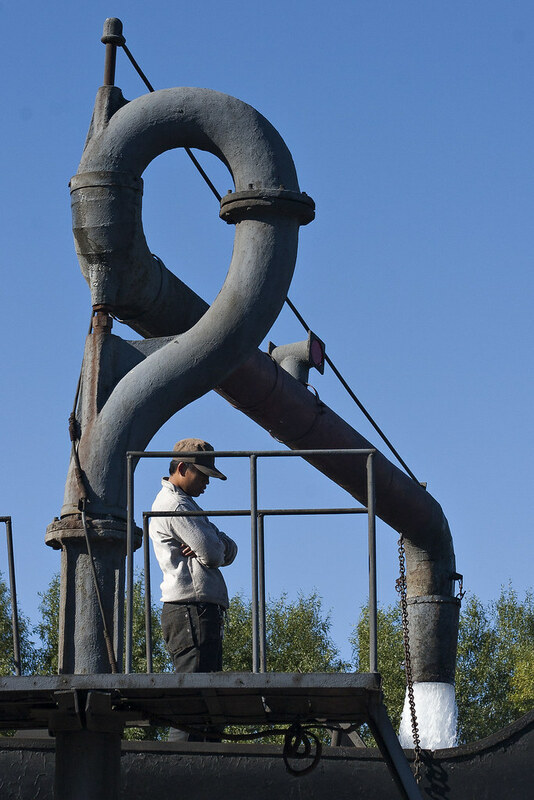 Jitong Railway welders prepare new fueling racks in Daban for the diesel locomotives that will replace steam in just two months. 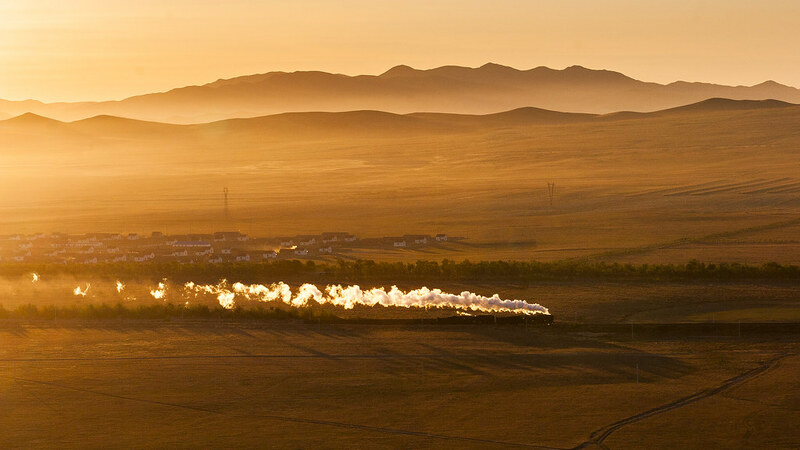 Just after sunrise on October 4, 2005, a short westbound freight train steams though Baomutu, Inner Mongolia, China, on the Jitong Railway. 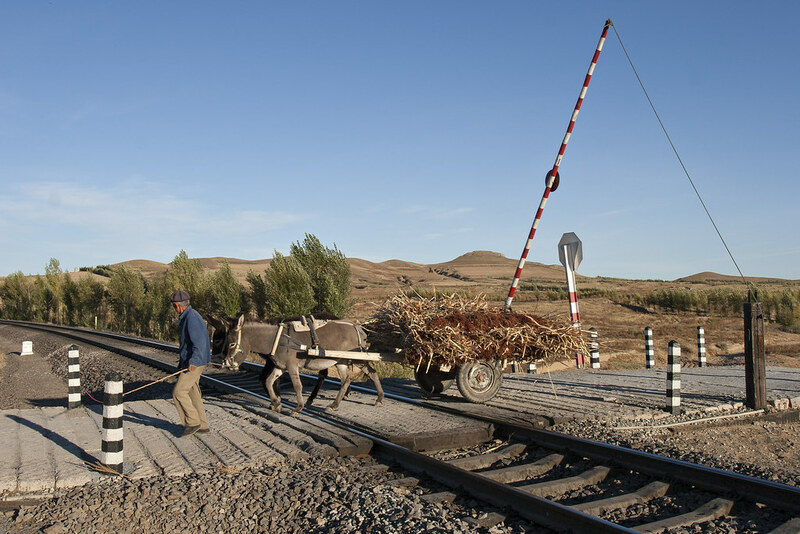 A farmer works the fields near Lindong as a westbound freight train passes behind him. 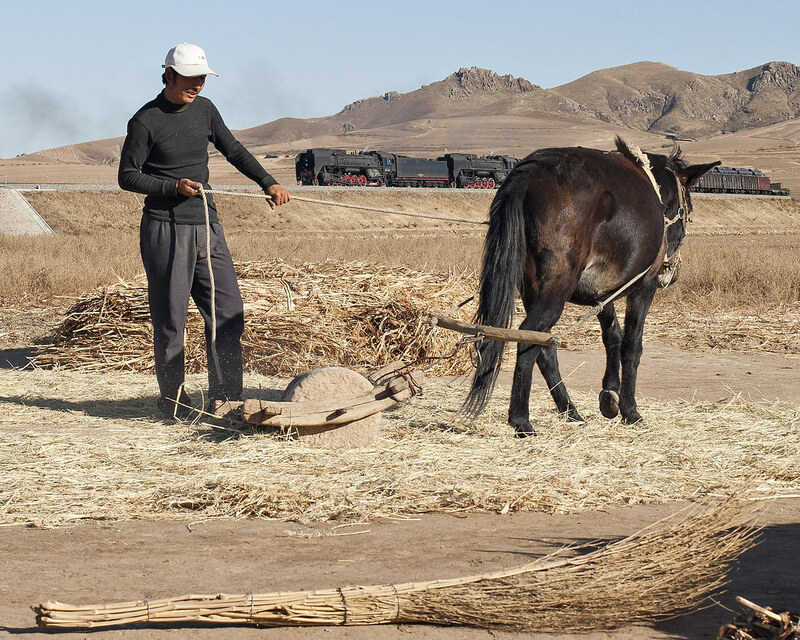 A farmer leads his donkey cart over the Jitong Railway near LIndong, Inner Mongolia, China, during the 2005 harvest. 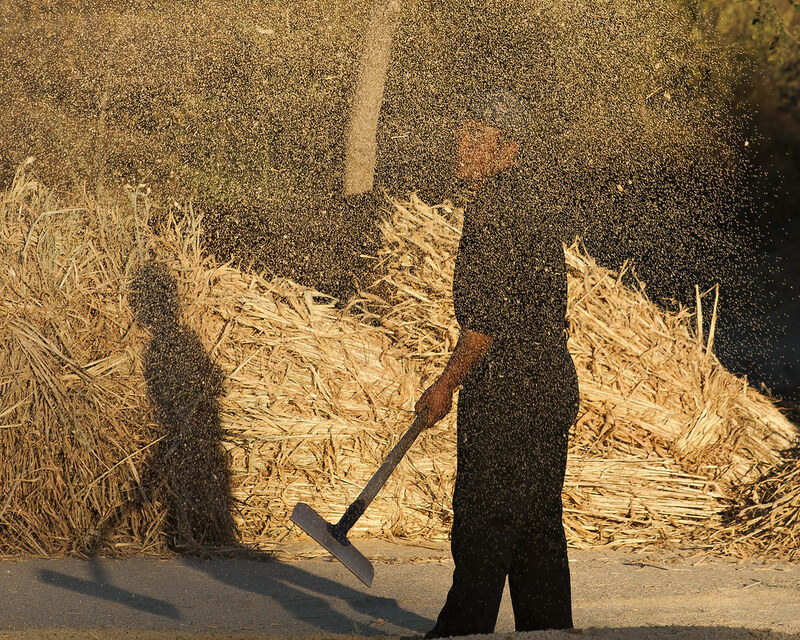 A farmer near Lindong winnows wheat by hand during the 2005 harvest. 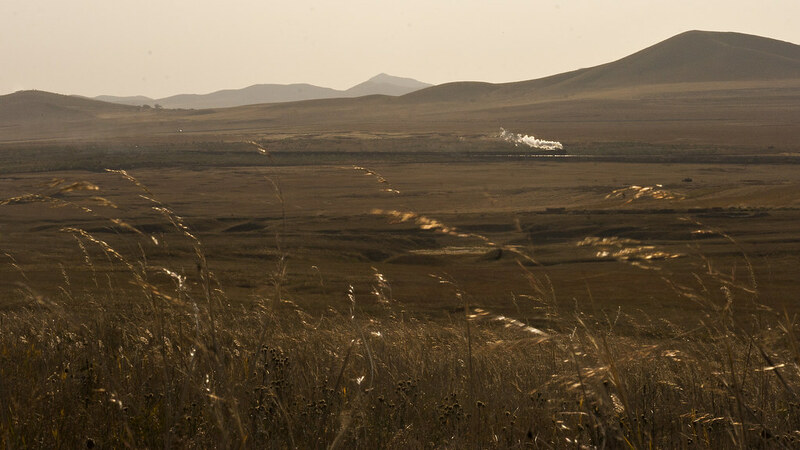 Westbound Jitong Railway freight train steaming through the windswept fields near Lindong, Inner Mongolia, China. Jitong Railway freight train sweeps through the s-curves near Chagganhada. 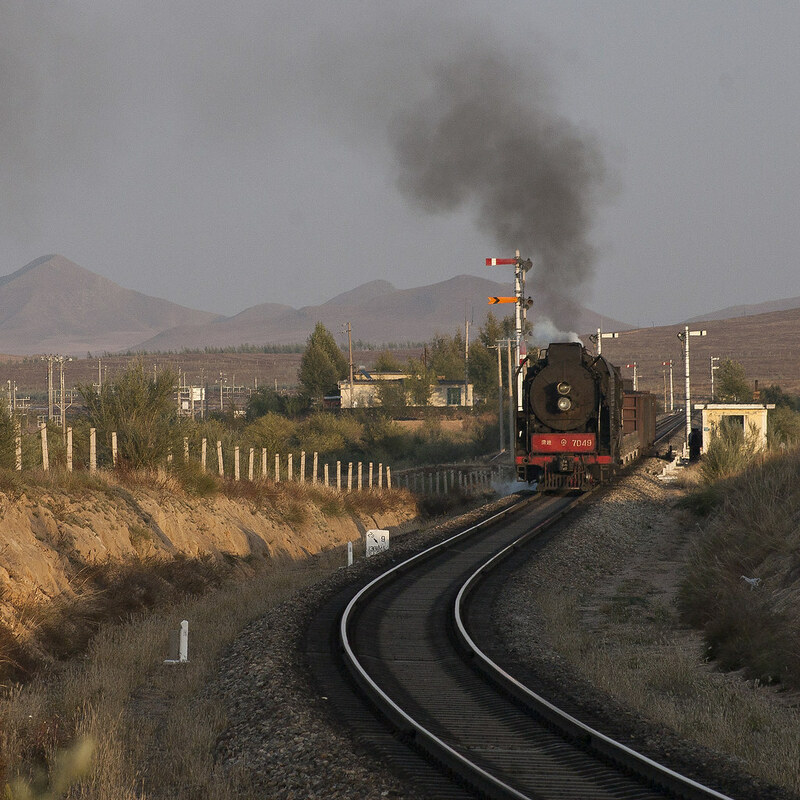 Just before sunset, a westbound Jitong Railway freight train departs Chagganhada. Westbound Jitong Railway freight train heads off into the sunset at Chagganhada.